Wrap-Up -- The shorthanded Cavaliers came into Denver on the second-half of a back-to-back and on the final game of an 11-day road trip. 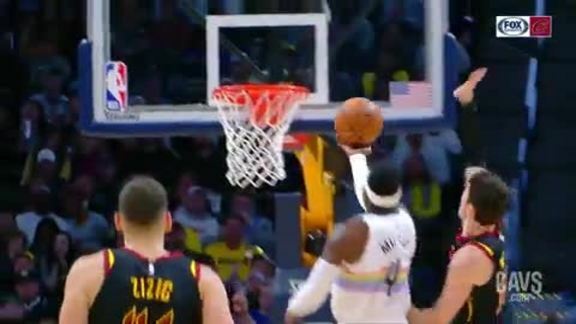 The Nuggets took full advantage – grabbing a 12-point lead after one quarter and doubling that edge by halftime, cruising through the second stanza to hand the road-weary Cavaliers the 124-102 loss and send them back to snowy Cleveland with a 1-5 mark on the longest junket of the season. 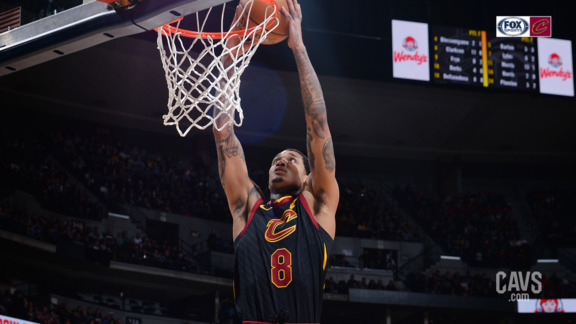 Playing once again without their two top bigs – Tristan Thompson and Larry Nance Jr. – and taking on arguably the best defensive center (Rudy Gobert) and best offensive center (Nikola Jokic) over the past two games, it was another long night for the Wine & Gold. 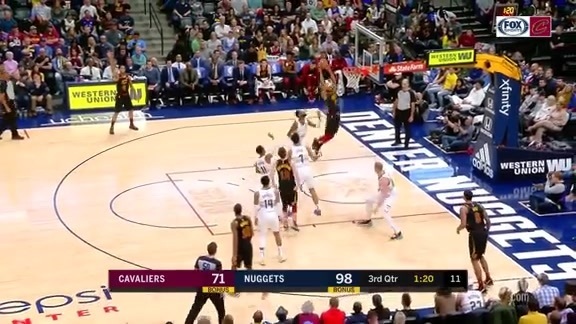 Despite the absence of Thompson and Nance Jr., the Cavs got another strong showing from their sophomore big man, Ante Zizic, who acquitted himself well against Jokic, a legitimate MVP candidate – finishing with a career-high 23 points, going 9-for-12 from the floor and 5-of-6 from the stripe, adding a team-high six boards in the loss. For his part, Jokic tallied his sixth triple-double of the season – finishing with 19 points and game-highs in assists (12) and rebounds (11). Defensively, the Wine & Gold looked like a squad that’s put on some major mileage. 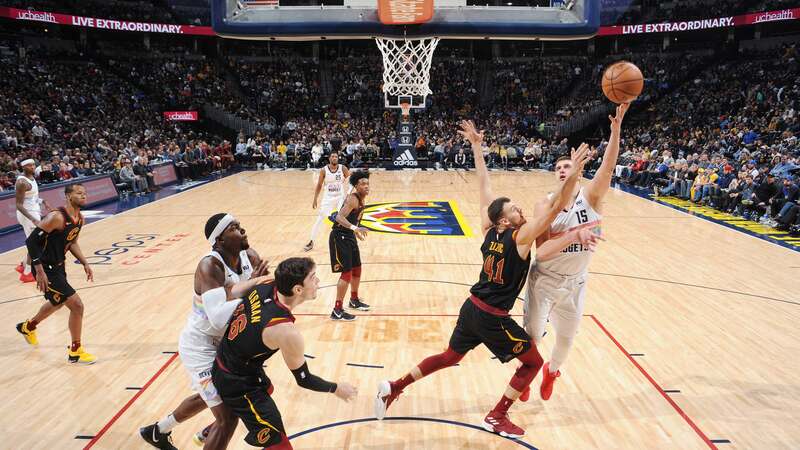 The Nuggets canned 15 three-pointers, shot 56 percent from the floor, dominated Cleveland on the boards, 43-28, and forced 14 turnovers that they turned into 22 points. Aside from Zizic’s career night, three other Cavalier starters – plus Jordan Clarkson – tallied double-figures. Rodney Hood followed up with 18 points on 5-of-9 shooting, including 2-of-5 from long-range and a perfect 6-of-6 from the line, adding three assists and a pair of steals. 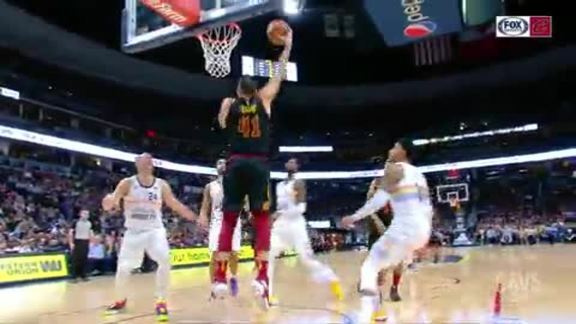 Cedi Osman added 17 points, going 6-of-10 from the floor, adding three boards, a steal and the squad’s only blocked shot – a nice chase-down swat against Paul Millsap in the third quarter. Collin Sexton finished with 10 points, but was just 4-of-13 from the field. Despite the cold-shooting night, Sexton did add four boards and a career-high seven assists. Cameron Payne got the spot start for Cleveland, but didn’t score a point or attempt a shot in just under 20 minutes of work. Jordan Clarkson rounded out the Cavaliers in double-figures, adding 13 points on 5-of-12 shooting. Osman scores in double figures for the 29th time this season. Turning Point -- There wasn’t much of a turning point in Saturday night’s loss. It was more of a death-by-a-thousand-cuts process. 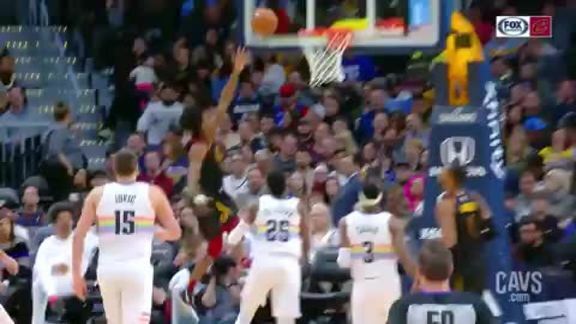 The Cavaliers hung tough with the Northwest Division-leading Nuggets through most of the first quarter, but Will Barton and Nikola Jokic each canned three-pointers in the final 1:19 of the period, turning a six-point edge into a 12-point edge. In the second, Denver began to assert its will – scoring the first eight points of the period and taking a 20-point lead three minutes into the quarter. By halftime, the lead was 24 and midway through the third the Nuggets extended it to 30. The Cavaliers wouldn’t get closer than 20 the rest of the way. By the Numbers – 19.0, 8.0, .667 … Ante Zizic’s scoring and rebounding numbers, plus field goal percentage in the trip-ending back-to-back against Utah and Denver. Up Next -- After dropping Saturday night’s decision in Denver, wrapping up their longest roadie of the season, the Wine & Gold return home for an MLK Day matinee against the Bulls at The Q. Afterwards, Cleveland gets right back on the road – traveling to Boston for a Wednesday night date against Kyrie Irving and the Celtics. The Cavs come home to face the Miami Heat on Friday night at The Q, travel to Chicago for a Sunday afternoon matchup with the Bulls before wrapping up the month of January with a visit from Bradley Beal and the Wizards next Tuesday night. 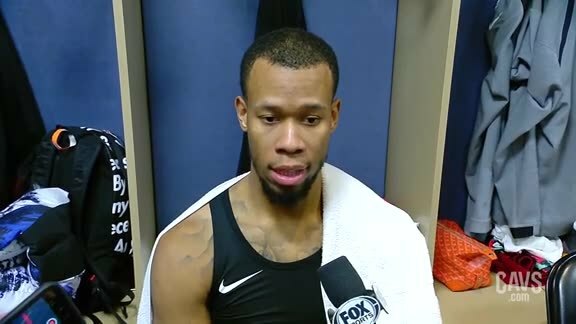 Cavaliers guard Rodney Hood spoke with the media following Saturday's loss to the Denver Nuggets at the Pepsi Center. 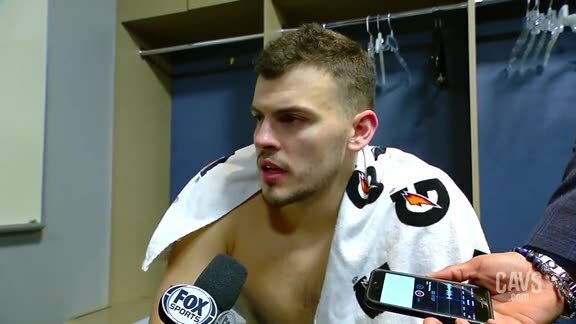 Cavaliers center Ante Zizic spoke with the media following Saturday's loss to the Denver Nuggets at the Pepsi Center. 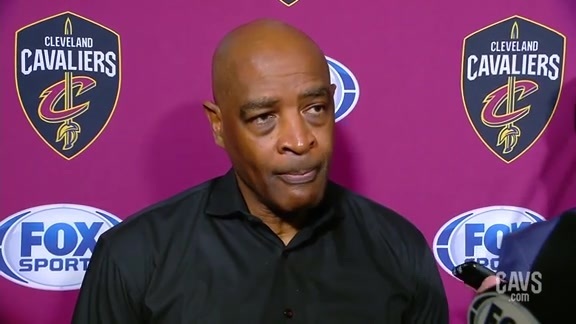 Cavaliers Head Coach Larry Drew spoke with the media following Saturday's loss to the Denver Nuggets at the Pepsi Center. Nikola Jokic notches a triple-double with 19 points, 11 rebounds and 12 assists as Denver gets the home win over Cleveland. Jaron Blossomgame picks up the loose ball and flings it to a wide open Jordan Clarkson for the uncontested dunk. 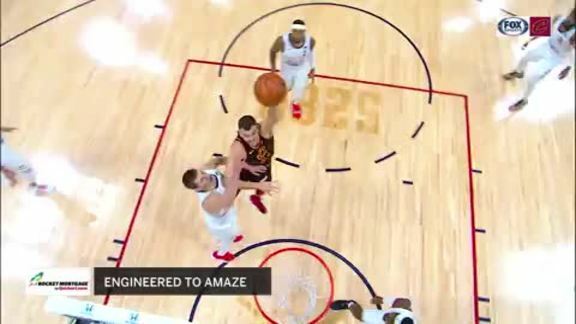 Matthew Dellavedova spots a rolling Jaron Blossomgame for the high-handoff connection. 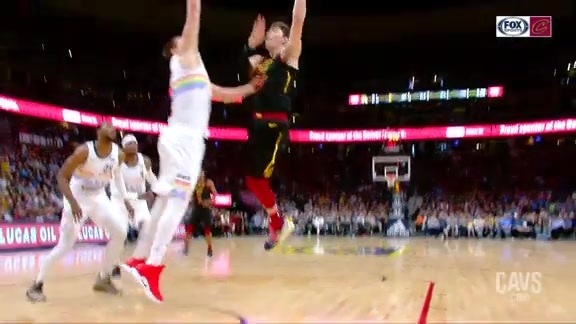 Cedi Osman hustles back on defense and rejects Paul Millsap's dunk attempt. Collin Sexton gets the rebound and dashes down the other end for the hoop and the harm. The Wine & Gold run the break as Cameron Payne drops the pretty dish to Ante Zizic for the transition two. Cedi Osman spins his way into the lane, draws the contact and finishes the tough lefty shot, plus the foul. 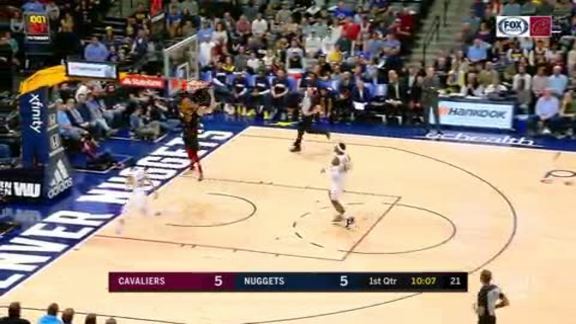 Ante Zizic fakes out the Nuggets defense for the easy layup in this ‘More Driven Highlight’ driven by Goodyear. Ante Zizic goes to work in the paint and shows off his foot work for the lefty hook on Nikola Jokić. Collin Sexton picks up the loose ball and whips it down the floor to a streaking Cedi Osman for the slam.